Water is an important thing in the daily life of a person.But do you ever think how this water comes to your home?If you are city person there has various distribution system available. But village person like me, normally they get water from wells or bores and we know the correct sources of water. In city or municipality, they have, water supply system to carry water from the treatment plant to homes and wastewater system to carry water from home to wastewater treatment plant. We need to maintain certain water quality parameters before its use and we have water softening techniques to maintain the quality of water. Watch the below video which shows the sewage treatment process. The separate system provides two separate systems of sewers the one intended for the conveyance of foul sewage only ,such faecal matter,domestic wastewaters,the washing ,and drainings of places such as slaughter housed,laundries ,stables and waste waters derived from the manufacturing processes and the other rainwater including the surface washing from certain streets overflow from public baths and foundations etc.. The load on the treatment units will be lowered since only the foul sewage carried by the separate sewers need be treated. The system will prove to be economical both from the point of view of capital costs as well as from the point of view of running cost. They are likely to get chocked. There will cause confusion of the systems due to connections being wrongly made. 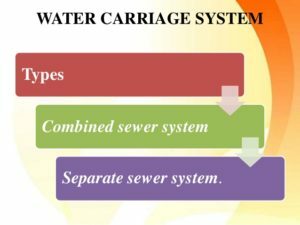 The Combined water carriage system provides only one sewer to carry both the foul sewage as well as the rainwater.This is another classification of water carriage system.The sewage and rainwater carried to the sewage treatment plant, before its final disposal. The combined system is advocated on the ground that street surface washings are as impure as the sewage itself and should, therefore, be suitably treated before being allowed to enter the natural stream. The system required only one set of sewers, Hence the maintenance costs are reduced. The sewers are of larger size and therefore the chances of their choking are rare. The strength of the sewage is reduced by dilution. The foul smell can be reduced. The load on water treatment plant increases. In partially combined systems, only one set of underground sewers is laid.These sewers admit the foul sewage as well as the early washings by rains.As soon as the quantity of water exceeds a certain limit, the water overflows, this water is collected and conveyed in open drains to the natural streams. The sewers are of reasonable size.Their cleaning is therefore not very difficult. It combines the advantages of both separate system and combined system. During the summers season, the velocity will be low due to the unavailability of enough water. The stormwater increases the load on treatment unit. The stormwater also increases the cost of pumping.